Now that we are into the last quarter of the year I thought it would be a good time to see how I’m doing with my current reading challenges. I’m currently participating in six reading challenges. While I have read at least one book in all challenges, I’m behind my goals for each. In some cases, way behind. R.I.P. – Read Frankenstein and watched The Mummy. Frankenstein was fabulous; The Mummy not so much. If I want to complete this challenge I just need to read one more book. Back to the Classics – Two books from the 12 categories. What’s In a Name – Two books out of six. 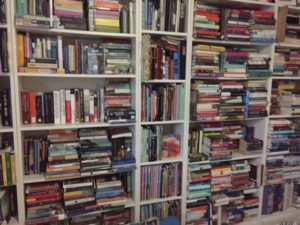 Read My Own Damn Books – My goal is to read 20 and so far I’m at 11. Poetry Reading challenge – Two collections out of five. Japanese Literature challenge – Read at least one book, so far none. Let’s see what the rest of the year brings. There are several other things to look forward to still, like Non-Fiction November, German Literature month also in November and no doubt I’m probably forgetting others that sound like fun. How about you, how are you doing with your challenges? But my mind is going to be on writers from Latin America and specifically Mexico for the next few days. You see, I’m off to Monterrey to do a quick visit with my family and fingers crossed that I’ll also get a chance to stop by the International Book Fair in Monterrey this weekend. So I hope you have a great week ahead and I’ll catch up with you soon! I’m doing okay with my reading goals for the year, challenges included, but I could easily lose track this time of year, with so many new books, borrowed from the library, pulling my attention in unexpected directions. I could just get lost in New Book Land for the rest of the year and, then, oops – there go those well laid January plans for this year! Enjoy your upcoming visit! I’m not involved in any challenges this year, but I always try to focus on nonfiction in November. We’ll see how I do! Safe travels to Monterrey! I haven’t signed up to participate in any challenges this year besides R.I.P. which I’ve technically finished but I’m still reading books towards. I am really looking forward to Nonfiction November as well! I just checked out Searching for Sunday and am hoping to start it soon. Good luck with all of your challenges!